Brain bleeds are one of the conditions of severe brain injury that usually need to be reversed by brain surgery. Neurosurgical advances have resulted in a more severely brain injured individuals surviving, particularly those with brain bleeds. Intervention to stop the bleed, reduce the ICP, substantially improves the chances for recovery. Yet, before we give all the credit to the neurosurgeon, we must also credit the heroes who got your loved one to the trauma center before it was too late. I once asked an experienced neuro-intensive care nurse what was the most important advancement in brain injury treatment. Her answer: the helicopter. The flight for life folks do an often dangerous job, that makes a tremendous difference. The second huge breakthrough in care over the last generation has been the CT scan, which can see most neurosurgical conditions before such conditions have the time to kill. Once you spot the killer, the neurosurgeon can intervene. If rapid intervention does not occur, the risk of death is significant and the extent of damage to brain tissue will go up exponentially. An intracranial (inside the skull – the cranium) lesion is a brain bleed. The brain is filled and fueled by blood. If any part of the brain is cut or split, it may cause a brain bleed. Even a slow bleed can potentially involve fatal pathology. Both blood vessels themselves or brain tissue can bleed. The bigger the blood vessel, the less time there is to repair the brain bleed to prevent further brain damage. While the brain is filled with blood, blood is only healthy if contained within blood vessels. Blood improperly touching neurons and other brain cells, is toxic to those cells. Area’s of the brain where large brain bleeds have occurred, will see significant cell death. For that reason, one of the first goals of neurosurgery is to stop the brain bleeds before they can kill additional brain cells. An epidural hemorrhage is a bleed which occurs between the dura and the brain. 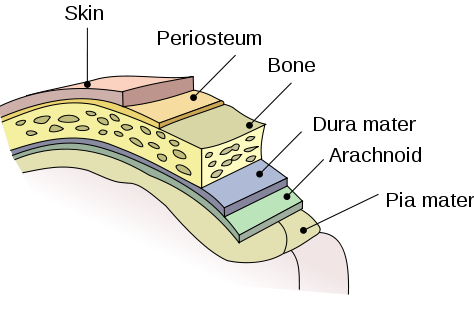 See the section on Understanding the Role of the Dura, on our previous page. While brain bleeds in the epidural space do not have the same risk of directly damaging brain tissue, they can cause rapid increases in ICP. An epidural bleed is a bleed which occurs in the space between the dura and the skull, referred as bone above. 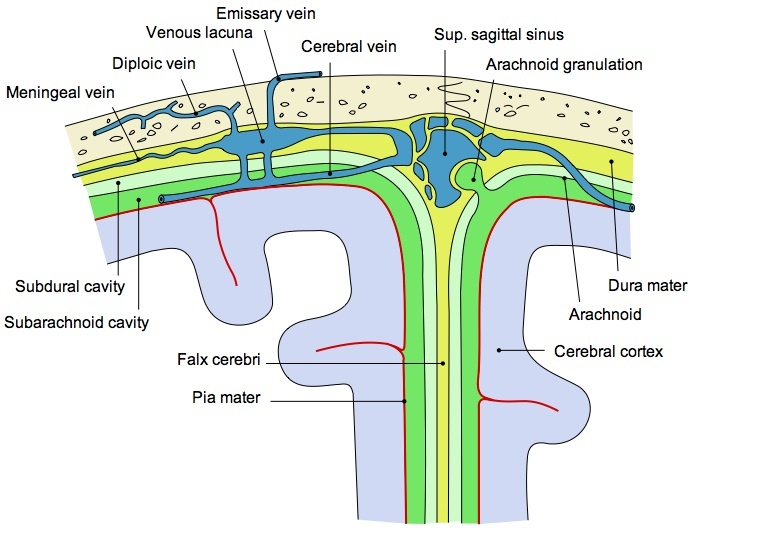 Subdural bleeds occur between the dura and the arachnoid membrane. The dura is the dark blue in this picture. The epidural space is an area where bleeding may quickly result in a compression of the brain as the epidural space fills with blood. Prompt brain surgery has great success in reducing the damage from an epidural hemorrhage. Subdural hemorrhages are brain bleeds which occur between the dura and the arachnoid membrane, which is another of the meninges which lay between the skull and the brain. Brain surgery is almost always critical. Shown are the dura (epidural above – subdural below), the subarchnoid space and the cerebral cortex (brain).